Dr. Ali Aslan Gümüsay is a postdoctoral researcher at the University of Hamburg and a research fellow at Vienna University of Economics & Business. He is an associate member of the Think Tank 30 of the Club of Rome, Head of the Advisory Board of the Social Incubator Zahnräder Network, board member at the Concordia Forum, academic board member at Ramsa, board member at AIWG and Non-Executive Director at Oxademy. Ali works as an academic, entrepreneur, speaker and consultant. Ali’s research and teaching interests include: organisation, management and institutional theory, strategic management, innovation, entrepreneurship and social entrepreneurship, leadership and business ethics, Islamic Finance as well as the interconnection of religion and business. 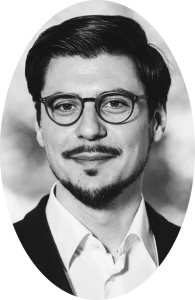 His work has been third-party funded by the DFG and DAAD with over €180,000 and also received further funding totaling over €300,000 from the Avicenna Foundation (BMBF), Hamburg University, Oxford University, Foundation of German Business (BMBF), and WU Vienna. Prior to his Fellowship, Ali was was a postdoctoral DAAD Prime Fellow at Vienna University of Economics & Business and the University of Hamburg, a Doctoral Scholar at Saïd Business School and Lecturer at Magdalen College, University of Oxford, member of Christ Church, and the Centre for Professional Services Firms at Oxford as well as a research fellow at LEAD. Before, he worked as a strategy consultant with the Boston Consulting Group. He gained an MSc in Management Research, graduating with Distinction from Saïd Business School and Green Templeton College, Oxford, a Diplôme in Social Sciences from Sciences Po Paris and a First Class Honours for his BSc in Economics, Politics and International Studies at Warwick University. He has a certificate in Islamic Finance Executive Education from Judge Business School, University of Cambridge, was an Affiliate at the Institute for Science, Innovation & Society, Saïd Business School, University of Oxford and read Islamic Studies at Magdalen College and the Oriental Studies Department of the University of Oxford.